The start of the New Year has brought fresh lows to the manufacturing sector with the month of January dominated by job losses, business suspensions and a lack of overall confidence. Figure 1: Australian Manufacturing Workforce Planning Scan 2012 (Jan 2013). Data sourced from Manufacturing Monthly Newsletter & News Archive. Some stories have been verified against primary resources. Figure 2: Australian Manufacturing Workforce Planning Positive/Negative Index 2012 (Jan 2013). Data sourced from Manufacturing Monthly Newsletter & News Archive. Some stories have been verified against primary resources. The four most dominant Workforce Planning stories for January were Employ (47.4%), Engagement (13.2%), IR and WH&S (both of which finished on 10.5%). Engagement (+3) and L&D/R&D (+2) were the most positive while Employ (-12) and WH&S (-4) were the most negative. The Employ category which tracks employment gains, losses and general sentiment overshadowed the news this month. At 47.4% this category made up almost half of the stories and as Table 1 shows there were 13-negative stories with a total loss 1304 jobs for only one gain of 200-jobs. 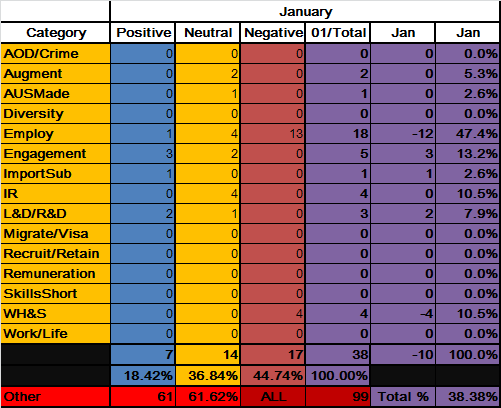 The high negativity this month was also the worst that I have currently recorded although my data only goes back to July 2012. In terms of sentiment there does seem to be linkages to a slowing construction sector, evident by the largest job loss recorded for the month when Boral axed at least 700-employees after a 100-day review. On a positive note the Indigenous Footy Business hopes to train 200 indigenous Australian’s and take back at least half of the football business which has been dominated by cheaper imports. Engagement, which includes items such as exhibitions and staff awards, came in as the second most discussed workforce planning item for January. Unsurprisingly it was also the most positive recording three stories, two of which originated from Victoria where the economy is heavily reliant on its manufacturing base and suffering as the sector atrophies. Equal third most reported for January were IR which tracks industrial actions and WH&S (Work Health and Safety). Industrial relations can be a very dominant story and in August of last year recorded a high of one third of all workforce planning stories. In January IR only reached 10.5% mainly around commentary by union officials including the Australian Workers Union Paul Howes criticism of the Boral redundancy decision. WH&S tracks everything from safety innovations to workplace accidents. Although no major injuries were recorded for January there was at least one work related fatality when a 40-year old man was struck by lifting equipment at a Newcastle based manufacturing plant. Here is a closer look at the January data. Table 1: Data for Australian Manufacturing Workforce Planning Scan 2012 (Jan 2013). Data sourced from Manufacturing Monthly Newsletter & News Archive. Some stories have been verified against primary resources. Table 2: Employment losses and gains 2013. Data sourced from Manufacturing Monthly Newsletter & News Archive. Some stories have been verified against primary resources. In summary, the opening month of manufacturing news has been a continuation on last years theme of a sector still in decline, impacted by many factors but also an Australian dollar which remains stubbornly high (averaging around $1.04 – $1.05 for the month). What will be interesting will be how manufacturing positions itself now that an election has just been called (to be held later this year on the 14th September) and what impact further weakening of this sector might do to the unfolding story. Update 1 (11/02/2013): During a data validation exercise I found that the stories being released via the Manufacturing Monthly eNewsletter, which I utilised as my primary source of data linkage, did not reflect the complete manufacturing coverage, thus Table 1 has been updated with an additional ‘Other’ article that was missed. As the Manufacturing Monthly news archive captures all the stories I will now be using that as my primary data source, although this will mean a 24-hour delay on Workforce Planning scan updates from February onwards.